Another version of the multiwicked pois: this one is with three wicks. An interesting element in the performance that can be used in many variations. You can use different pois at the same time which gives new perspectives to usual tricks. There are three wicks at the end of the chain. The lower wicks are bigger and heavier to preserve the sweep of the poi. Otherwise, the chain would jerk or collapse during a slower play. 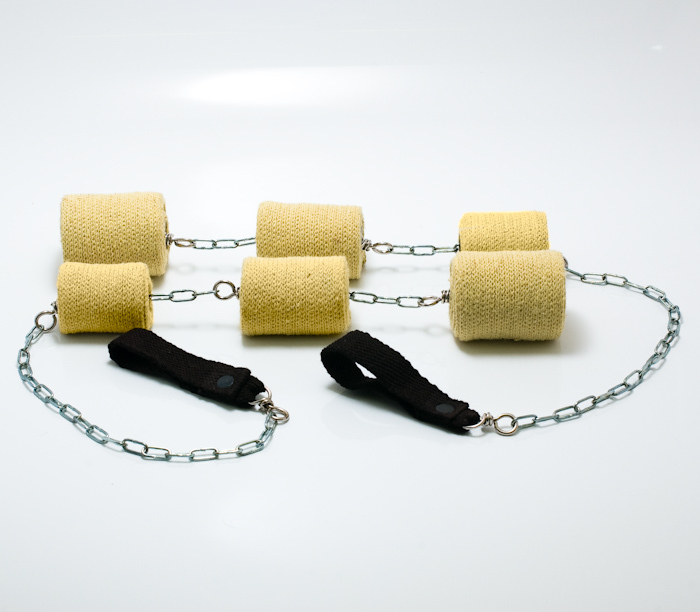 I use welded chains with a swivel at their ends to avoid the chain from curling up. For safety reasons I do not use any split rings. I use single loop handles that are fixed to the chain by a swivel. This kind of handle is very easy to use, moreover it is safe and comfortable. The handle should be worn on the little finger, so you can lead the poi precisely with your thumb and index finger. Optionally, you can order the pois with monkeyfist handles, if you like the throwing tricks.